"Aragonés" redirects here. For people with the surname Aragonés, see Aragonés (surname). 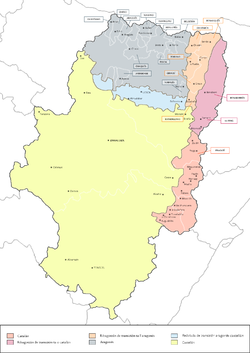 Aragonese (/ˌærəɡɒˈniːz/; aragonés [aɾaɣoˈnes] in Aragonese) is a Romance language spoken in several dialects by 10,000 to 30,000 people in the Pyrenees valleys of Aragon, Spain, primarily in the comarcas of Somontano de Barbastro, Jacetania, Alto Gállego, Sobrarbe, and Ribagorza/Ribagorça. It is the only modern language which survived from medieval Navarro-Aragonese in a form distinctly different from Spanish. Informally known as fabla ("talk" or "speech"), Aragonese is also commonly referred to by the names of its local dialects such as cheso (from Valle de Hecho) or patués (from the Benasque Valley). The gradual retreat of Aragonese under the pressure of Castilian (Spanish). Aragonese, which developed in portions of the Ebro basin, can be traced back to the High Middle Ages. It spread throughout the Pyrenees to areas where languages similar to Basque were previously spoken. The Kingdom of Aragon (formed by the counties of Aragon, Sobrarbe and Ribagorza) expanded southward from the mountains, pushing the Moors farther south in the Reconquista and spreading the Aragonese language. The union of the Catalan counties and the Kingdom of Aragon which formed the 12th-century Crown of Aragon did not merge the languages of the two territories; Catalan continued to be spoken in the east and Navarro-Aragonese in the west, with boundaries blurred by dialectal continuity. The Aragonese Reconquista in the south ended with the cession of Murcia by James I of Aragon to the Kingdom of Castile as dowry for an Aragonese princess. The best-known proponent of the Aragonese language was Johan Ferrandez d'Heredia, the Grand Master of the Knights Hospitaller in Rhodes at the end of the 14th century. He wrote an extensive catalog of works in Aragonese and translated several works from Greek into Aragonese (the first in medieval Europe). The spread of Castilian (Spanish), the Castilian origin of the Trastámara dynasty, and the similarity between Castilian (Spanish) and Aragonese facilitated the recession of the latter. A turning point was the 15th-century coronation of the Castilian Ferdinand I of Aragon, also known as Ferdinand of Antequera. In the early 18th century, after the defeat of the allies of Aragon in the Spanish Succession War, Philip V ordered the prohibition of the Aragonese language in the schools and the establishment of Castilian (Spanish) as the only official language in Aragon. This was ordered in the Aragonese Nueva Planta decrees of 1707. In recent times, Aragonese was mostly regarded as a group of rural dialects of Spanish. Compulsory education undermined its already weak position; for example, pupils were punished for using it. However, the 1978 Spanish transition to democracy heralded literary works and studies of the language. Aragonese is the native language of the Aragonese mountain ranges of the Pyrenees, in the comarcas of Somontano, Jacetania, Sobrarbe, and Ribagorza. Cities and towns in which Aragonese is spoken are Huesca, Graus, Monzón, Barbastro, Bielsa, Chistén, Fonz, Echo, Estadilla, Benasque, Campo, Sabiñánigo, Jaca, Plan, Ansó, Ayerbe, Broto, and El Grado. It is spoken as a second language by inhabitants of Zaragoza, Huesca, Ejea de los Caballeros, or Teruel. According to recent polls, there are about 25,500 speakers(2011)  including speakers living outside the native area. In 2009, the Languages Act of Aragon (Law 10/2009) recognized the "native language, original and historic" of Aragon. The language received several linguistic rights, including its use in public administration. This legislation was repealed by a new law in 2013 (Law 3/2013). Aragonese expanded into the territories of the Kingdom of Aragon from the 12th to the 16th centuries. Aragonese has many historical traits in common with Catalan. Some are conservative features that are also shared with the Astur-Leonese languages and Galician-Portuguese, where Spanish innovated in ways that did not spread to nearby languages. Romance initial F- is preserved, e.g. FILIUM > fillo ("son", Sp. hijo, Cat. fill, Pt. filho). Romance palatal approximant (GE-, GI-, I-) consistently became medieval [dʒ], as in medieval Catalan and Portuguese. This becomes modern ch [tʃ], as a result of the devoicing of sibilants (see below). In Spanish, the medieval result was either [dʒ] (modern [x]), [ʝ] or nothing, depending on the context. E.g. IUVENEM > choven ("young man", Sp. joven /ˈxoβen/, Cat. jove /ˈʒoβə/), GELARE > chelar ("to freeze", Sp. helar /eˈlaɾ/, Cat. gelar /ʒəˈla/). Romance groups -LT-, -CT- result in [jt], e.g. FACTUM > feito ("done", Sp. hecho, Cat. fet, Gal./Port. feito), MULTUM > muito ("many"/"much", Sp. mucho, Cat. molt, Gal. moito, Port. muito). Romance groups -X-, -PS-, SCj- result in voiceless palatal fricative ix [ʃ], e.g. COXU > coixo ("crippled", Sp. cojo, Cat. coix). Romance groups -Lj-, -C'L-, -T'L- result in palatal lateral ll [ʎ], e.g. MULIERE > muller ("woman", Sp. mujer, Cat. muller), ACUT'LA > agulla ("needle", Sp. aguja, Cat. agulla). Open O, E from Romance result systematically in diphthongs [we], [je], e.g. VET'LA > viella ("old woman", Sp. vieja, Cat. vella). This includes before a palatal approximant, e.g. octō > ueito ("eight", Sp. ocho, Cat. vuit). Spanish diphthongizes except before yod, whereas Catalan only diphthongizes before yod. Loss of final unstressed -E but not -O, e.g. GRANDE > gran ("big"), FACTUM > feito ("done"). Catalan loses both -O and -E; Spanish preserves -O and sometimes -E.
Former voiced sibilants become voiceless ([z] > [s], [dʒ] > [tʃ]). Latin -B- is maintained in past imperfect endings of verbs of the second and third conjugations: teneba, teniba ("he had", Sp. tenía, Cat. tenia), dormiba ("he was sleeping", Sp. dormía, Cat. dormia). High Aragonese dialects (alto aragonés) and some dialects of Gascon have preserved the voicelessness of many intervocalic stop consonants, e.g. CLETAM > cleta ("sheep hurdle", Cat. cleda, Fr. claie), CUCULLIATAM > cocullata ("crested lark", Sp. cogujada, Cat. cogullada). Several Aragonese dialects maintain Latin -ll- as geminate /ll/. In 2010, the Academia de l'Aragonés (founded in 2006) established an orthographic standard to modernize medieval orthography and to make it more etymological. The new orthography is used by the Aragonese Wikipedia. The grafía de Uesca, codified in 1987 by the Consello d'a Fabla Aragonesa (CFA) at a convention in Huesca, is used by most Aragonese writers. It has a more uniform system of assigning letters to phonemes, with less regard for etymology; words traditionally written with ⟨v⟩ and ⟨b⟩ are uniformly written with ⟨b⟩ in the Uesca system. Similarly, ⟨ch⟩, ⟨j⟩, and ⟨g⟩ before ⟨e⟩ and ⟨i⟩ are all written ⟨ch⟩. It uses letters associated with Spanish, such as ⟨ñ⟩. The grafía SLA, devised in 2004 by the Sociedat de Lingüistica Aragonesa (SLA), is used by some Aragonese writers. It uses etymological forms which are closer to Catalan, Occitan, and medieval Aragonese sources. In the SLA system ⟨v⟩, ⟨b⟩,⟨ch⟩, ⟨j⟩, and ⟨g⟩ before ⟨e⟩ and ⟨i⟩ are distinct, and the digraph ⟨ny⟩ replaces ⟨ñ⟩. During the 16th century, Aragonese Moriscos wrote aljamiado texts (Romance texts in Arabic writing), possibly because of their inability to write in Arabic. The language in these texts has a mixture of Aragonese and Castilian traits, and they are among the last known written examples of the Aragonese formerly spoken in central and southern Aragon. Aragonese grammar is similar to that of other Iberian Romance languages, such as Spanish and Catalan. The second (auxiliary) article, after a vowel, is used with an r (pronounced [ɾ]). Neighboring Romance languages have influenced Aragonese. Catalan and Occitan influenced Medieval Aragonese, and the Catalan influence continued under the Crown of Aragon in the Ribagorçan dialect. Since the 15th century, Spanish has most influenced Aragonese; it was adopted throughout Aragon as the first language, limiting Aragonese to the northern region surrounding the Pyrenees. French has also influenced Aragonese; Italian loanwords have entered through other languages (such as Catalan), and Portuguese words have entered through Spanish. Germanic words came with the conquest of the region by Germanic peoples during the fifth century, and English has introduced a number of new words into the language. Many ending in -a are feminine: a Cinca/a Cinga, a Cinqueta, a Garona, L'Arba, a Noguera, a Isuela, La Uecha, La Uerva, etc. The latter was known as río de la Uerba during the 16th century. Many from the second and the third declension are masculine: L'Ebro, O Galligo, O Flumen, L'Alcanadre. Unlike most other Ibero-Romance varieties, Aragonese has partitive and locative clitic pronouns derived from the Latin inde and ibi: en/ne and bi/i/ie. Such pronouns are present in most major Romance languages (Catalan en and hi, Occitan ne and i, French en and y, and Italian ne and ci/vi). Partitive objects: No n'he visto como aquello ("I haven't seen anything like that", literally 'Not (of it) I have seen like that'). Aragonese was not written until the 12th and 13th centuries; the history Liber Regum, Razón feita d'amor, Libre dels tres reys d'orient, and Vida de Santa María Egipcíaca date from this period, there is also an Aragonese version of the Chronicle of Morea, differing also in its content and written in the late 14th century called Libro de los fechos et conquistas del principado de la Morea. Since 1500, Spanish was the cultural language of Aragon; many Aragonese wrote in Spanish, and during the 17th century the Argensola brothers went to Castile to teach Spanish. Aragonese became a popular village language. During the 17th century, popular literature in the language began to appear. In a 1650 Huesca literary contest, Aragonese poems were submitted by Matías Pradas, Isabel de Rodas and "Fileno, montañés". The 19th and 20th centuries have seen a renaissance of Aragonese literature in several dialects. In 1844, Braulio Foz' novel Vida de Pedro Saputo was published in the Almudévar (southern) dialect. The 20th century featured Domingo Miral's costumbrist comedies and Veremundo Méndez Coarasa's poetry, both in Hecho (western) Aragonese; Cleto Torrodellas' poetry and Tonón de Baldomera's popular writings in the Graus (eastern) dialect and Arnal Cavero's costumbrist stories and Juana Coscujuela' novel A Lueca, historia d'una moceta d'o Semontano, also in the southern dialect. The 1997 Aragonese Law of languages stipulated that Aragonese (and Catalan) speakers had a right to the teaching of and in their own language. Following this, Aragonese lessons started in schools in the academic year 1997/98. It was originally taught as an extra-curricular, non-evaluable voluntary subject in four schools. However, whilst legally schools can choose to use Aragonese as the language of instruction, as of the academic year 2013/14, there are no recorded instances of this option being taken in primary or secondary education. In fact, the only current scenario in which Aragonese is used as the language of instruction is in the university course of Aragonese Philology, which is optional, taught over the summer and still only given in Aragonese in some of the lectures. In pre-school education, students, whose parents wish for them to be taught Aragonese, receive between thirty minutes to one hour of Aragonese lessons a week. In the 2014/15 academic year there were 262 students recorded in pre-school Aragonese lessons. The subject of Aragonese now has a fully developed curriculum in primary education in Aragon. Despite this, in academic year 2014/2015 there were only seven Aragonese teachers in the region across both pre-primary and primary education and none hold permanent positions, whilst the number of primary education students receiving Aragonese lessons was of 320. ^ Hammarström, Harald; Forkel, Robert; Haspelmath, Martin, eds. (2017). "Aragonese". Glottolog 3.0. Jena, Germany: Max Planck Institute for the Science of Human History. ^ Some orthographic details related to local dialects are not listed. ^ Francho Nagore, Gramica de la Lengua Aragonesa. Mira Editores (1989). ^ a b Huguet, Dr Ángel; Lapresta, Cecilio; Madariaga, José M. (2008-11-01). "A Study on Language Attitudes Towards Regional and Foreign Languages by School Children in Aragon, Spain". International Journal of Multilingualism. 5 (4): 275–293. doi:10.1080/14790710802152412. ISSN 1479-0718. ^ a b c d e f g Martínez Cortés, Juan Pablo; Paricio Martín, Santiago J. (2017). The Aragonese language in education in Spain (Mercator dossier) (PDF). ISSN 1570-1239. Martínez Cortés, Juan Pablo; Paricio Martín, Santiago J. (2017). The Aragonese Language in Education in Spain (PDF). Leeuwarden: Mercator. For a list of words relating to Aragonese language, see the Aragonese language category of words in Wiktionary, the free dictionary. Wikimedia Commons has media related to Aragonese language. This page was last edited on 4 March 2019, at 19:42 (UTC).